Here at Shadow we make several different types of hub guards for every need. Here’s a quick break down of the guards we make and which work best with certain set ups and applications. This guard is designed for use exclusively with the BTR rear hub. It replaces the non-drive side cone, maintaining the width of the hub at 110mm. No need to try and stuff or wedge the guard in and compromise the rear end. Is not compatible with other hubs. Available in both CNC’d chromoly and aluminum versions. This guard is a ‘universal’ style non-drive side guard. Remove the non-drive lock nut to install. When the lock nut is removed , the rear end width will usually stay within the 110mm range. CNC made aluminum alloy outer shell with a chromoly insert. Chromoly version coming soon! We offer two versions of this guard, the BTR and Universal. The BTR guard is designed for use exclusively with the BTR rear hub. It replaces the drive side cone, maintaining the width of the hub at 110mm. The Universal version is designed for most threaded 14mm axles and includes a special cone that replaces the hub’s stock cone. 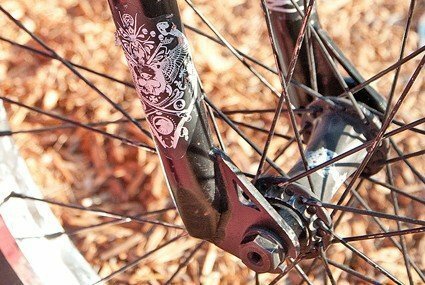 Also includes an assortment of spacers to dial in the fit for various hubs. Both of these guards maintain the hub width at 110mm. No need to try and stuff or wedge the guard in the rear end, they keep the hub at the stock width so you don’t have to wreck your chain alignment and rear triangle. CNC’d from billet chromoly, then heat treated to maximize the strength.